WASHINGTON The technologically-advanced destroyer Zumwalt underwent propulsion repair work in mid-January, the US Navy confirmed Tuesday. "The ship's hull was cut above the water line to enable the most effective means of conducting repair work on one of 12 propulsion motor drives," said Capt. Thurraya Kent, spokesperson for the Navy's acquisition directorate. Kent couldn't say precisely what the problem was, but she and other officials stressed that hull cuts are relatively routine to gain access to significant internal systems. "The work took place in the weeks following initial trials and was done in parallel with the activation of propulsion systems," Kent added. "The overall impact to the propulsion system was minor." 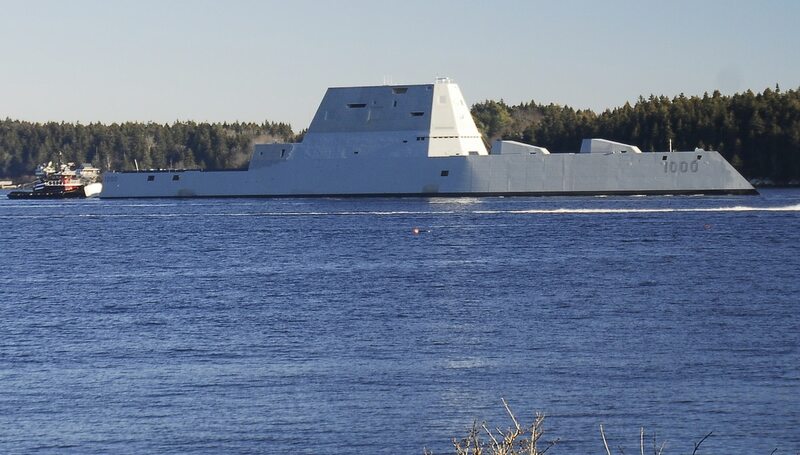 The Zumwalt is in the final stages of fitting out at the General Dynamics Bath Iron Works shipyard in Bath, Maine. The 610-foot-long ship, first of a three-ship class, features an unusual tumblehome hull form to enhance stealth qualities, and is powered by an integrated electrical propulsion system driven by gas turbines and advanced induction motors. The ship went to sea for the first time on Dec. 7 to conduct initial builder's sea trials, and operated along the Maine coast for nearly a week before returning to Bath on Dec. 13. A second round of sea trials was tentatively scheduled for late February, but the Zumwalt has not been back to sea since the first round. Results of those first sea trials, Navy officials have said, were generally positive. The Zumwalt "successfully completed her first at-sea trials in December and is readying to return to sea next month," Sean Stackley, the Navy's top acquisition official, told Congress on Feb. 25. "The ship is progressing well and is on track to complete trials and delivery later this spring," Kent said Tuesday. At least one more round of builder's trials is expected before the Navy's Board of Inspection and Survey comes aboard to carry out acceptance trials. Should those prove successful, the Navy will take ownership of the destroyer. A formal commissioning ceremony at Baltimore, Maryland will then take place before the ship heads west to her permanent home port of San Diego, California.